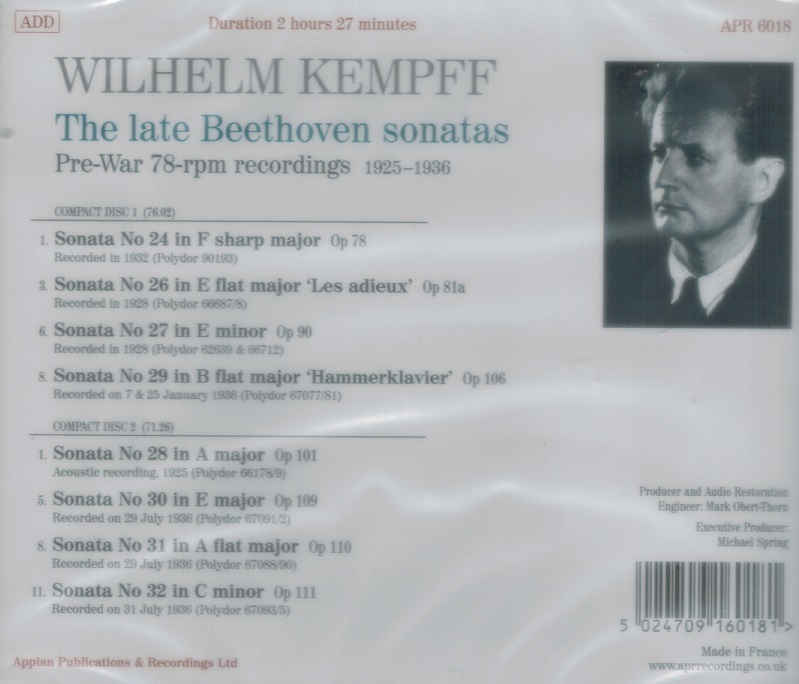 "Wilhelm Kempff had such a long life and recorded so prolifically in the LP era that we tend to forget that he began his recording career in 1920 in the acoustic period, and recorded 24 of the 32 Beethoven sonatas on 78s. Indeed, in the pre-war period he was second only to Schnabel (whose complete cycle was done in the 1930s) in the amount of Beethoven he recorded, and he made the first ever recordings of the sonatas op.81a, op.90 and op.101, included in this set. 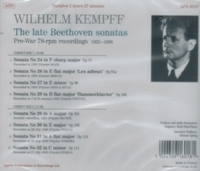 Kempff went on to record two complete sonata cycles in the 1950s and 1960s but he has always been regarded as a poetic and lyrical player and his Beethoven is therefore more closely allied to Mozart than the more barnstorming approach of others. The ‘first thoughts’ included here are perhaps the freest of all his recordings and have an almost improvisatory feel. Perhaps the impossibility of editing at this period captured Kempff more naturally than in his later efforts. None of the recordings included here is currently available elsewhere, and Op.90 and Op.101 have never been reissued since their original release on 78s. The acoustic Op.101 is a particularly rare item barely known to collectors. 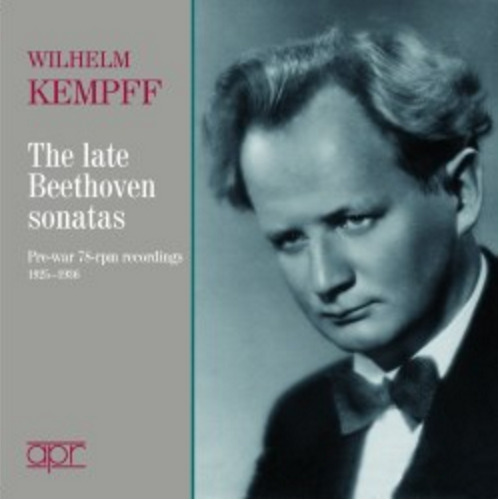 One of the twentieth century's most important pianists, Wilhelm Kempff found warmth in Beethoven where many others discovered only stress and passion. Concentrating on the composers of the late Classical and early-to-middle Romantic periods, Kempff achieved graceful, amiable results while not neglecting the sterner core of this music. His nobility of purpose was everywhere evident, made manifest through lucid textures, an adherence to a flowing legato, and tonal shading. In addition, he was a composer whose oeuvre included two symphonies, four operas, songs, and solo piano works. In 1914, Kempff traveled to Potsdam for studies at the Viktoriagymnasium before returning to Berlin to finish his work at the Hochschule and enroll at the university. At age 20, Kempff served as organist and pianist on a tour of Germany and Scandinavia by the Berlin Cathedral Choir. A successful 1917 piano recital at the Berlin Singakademie led to an engagement the following year with the Berlin Philharmonic, the first of innumerable collaborations with that august ensemble. During the 1920's and 1930's, he toured South America and Japan, as well as many parts of Europe, adding to his reputation for uncompromising musicianship and personable interpretation. At the same time, he taught, serving first as director at the Stuttgart Musikhochschule from 1924 to 1929 and, later, as piano instructor at Potsdam's Mamorpalais for the decade before WWII. The war kept his activities confined to Germany, but with its end, Kempff once more resumed a busy performance schedule.